The Gibson Les Paul Faded Studio T is one of the best surprises of 2016. I love Les Pauls. I bet you do too. I love the weight around my shoulders, the way the neck fits my hand, the feel of the arched top under my forearm and the bouncy, forgiving tension of the strings when I strum a chord. Of course most of all I love the sound, that resonant, crunchy, growly tone with gut-rumbling lows and singing harmonics. 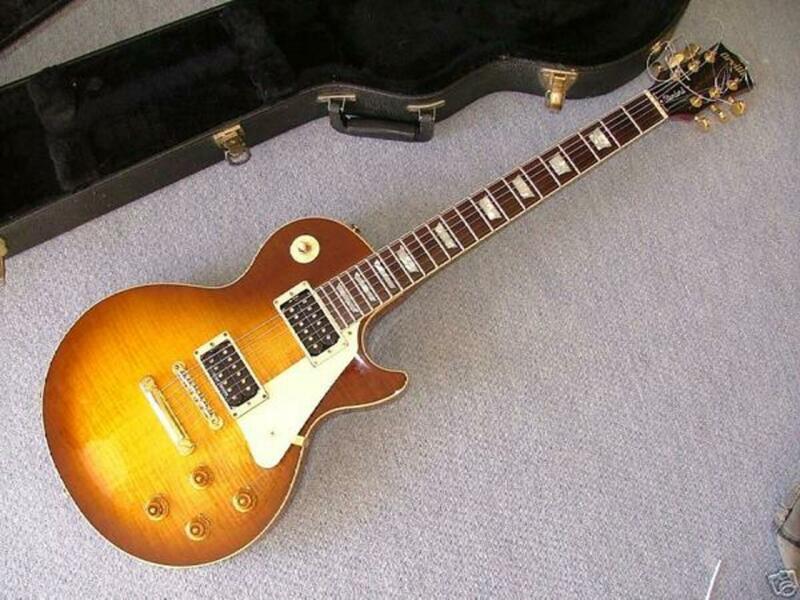 Yes, I love Les Pauls, and I bet you do too. But Les Pauls are expensive, and that I don’t love so much. Every time I’ve purchased one I’ve had to take a few moments to regain my composure in my car after leaving the guitar shop. That is, until a few days ago, when I finally took the plunge and grabbed a 2016 Gibson Les Paul Studio Faded T.
I’m been chomping at the bit for a new Studio for a couple of years. In 2014 and 2015 Gibson made some changes that I didn’t like at all, so I held off. But for 2016 they reintroduced most of the great stuff about the older model Studio in the form of the Studio T, which comes in around $1500. They also gave us the Faded T version, at a price cut of almost half. It was obvious that 2016 would be a year of some serious decisions. Gibson has been tinkering around the $700-$800 price point for a little while now. 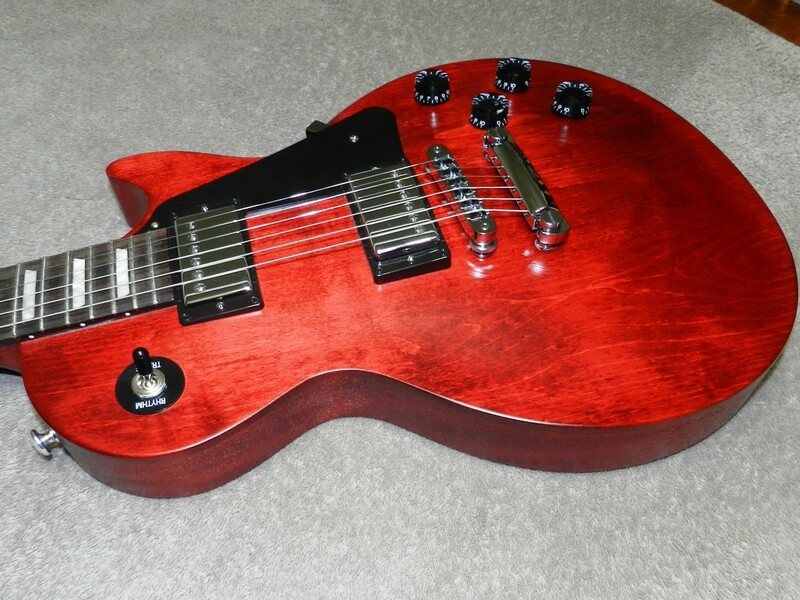 In 2013 they released the affordable Les Paul LPJ and many players loved it. But by 2015 it was gone from their lineup, replaced by the somewhat pricier LPM. I held off on both of those guitars for various reasons, but when the Studio Faded T showed up it seemed too good to pass up. 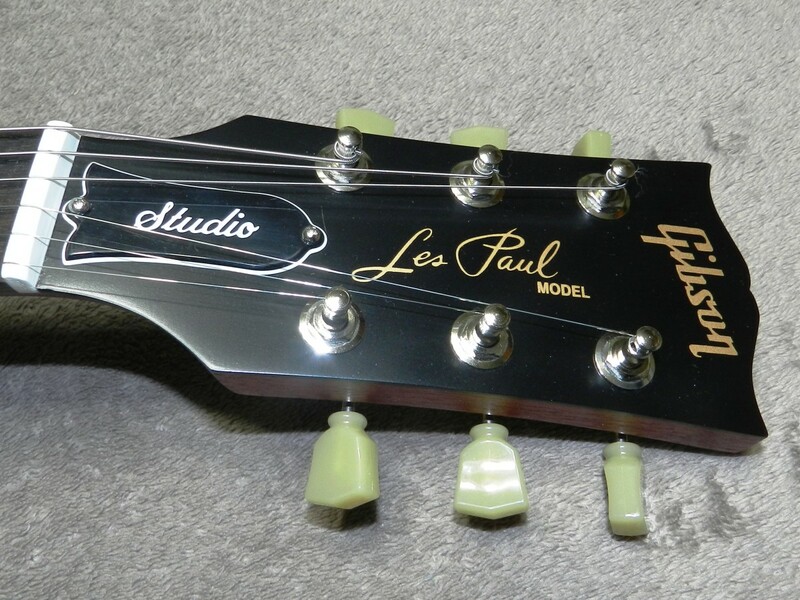 In this review I’ll go over my thoughts on my new Les Paul Studio Faded T, and discuss some of the reasons I chose this guitar instead of dropping the cash on the Studio T or some of the affordable Les Pauls that came before it. The Faded Studio is built the way a Les Paul ought to be: Mahogany body with a set mahogany neck and a carved maple top. This is a little different from the LPJ and LPM. They had maple necks, which is fine, but not quite Paul-ish. Mahogany is where it’s at when it comes to nailing that classic Gibson sound. I am very impressed by the construction of this guitar. I’ve handled faded-finish Gibsons before that seemed a bit rough, but not this one. The neck joint is solid and snug and the seam where the rosewood fretboard meets the mahogany neck is smooth as glass. The maple top looks great under the faded finish, which will of course be different on each individual guitar. The finish is a thin nitrocellulose satin lacquer, as opposed to the high-gloss finish on the Studio T. This accounts, at least in part, for the pricing difference. I have a Honey Blonde ’03 Highway One Stratocaster with a thin nitro finish and it has worn well over the years. I hope for the same from my new Les Paul. The back of the neck is smooth and comfortable. Despite my aforementioned love of the Les Paul, a finished, glossy neck is one thing I’m not wild about. I do like the feel of unfinished or tung-oiled necks, and I’ve even been known to take a sheet of light-gauge sandpaper to the necks of my Strats. Obviously I would never be so daft as to sand down the neck of a Les Paul, so the silky feel of the satin finish on this guitar is perfect for me, and the best of both worlds. 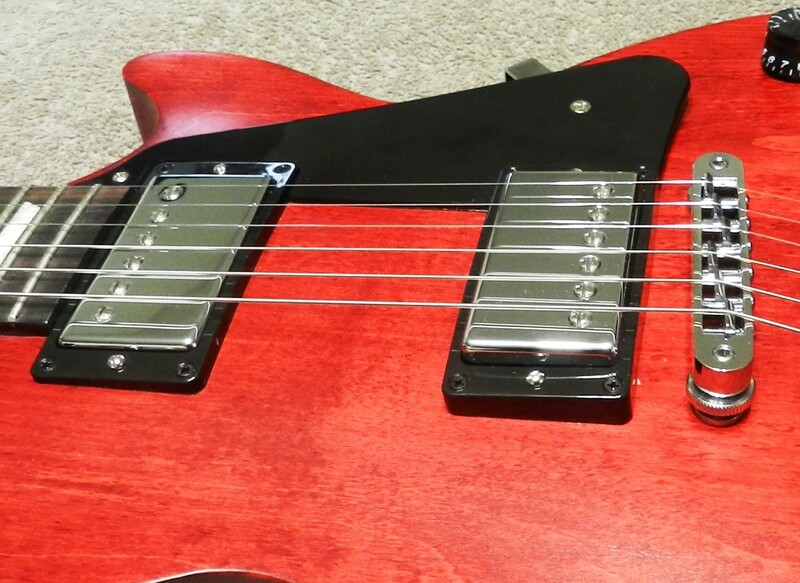 The neck itself is Gibson’s Rounded profile design. I’ll admit when I read about the different neck profiles from different guitar companies my eyes glaze over a bit. I think you never really know if a neck is right for you until you spend some time with it. I like moderately thick necks, and so far the Studio Faded works well for me. The Grover Green-key tuners are solid, and look pretty cool too! 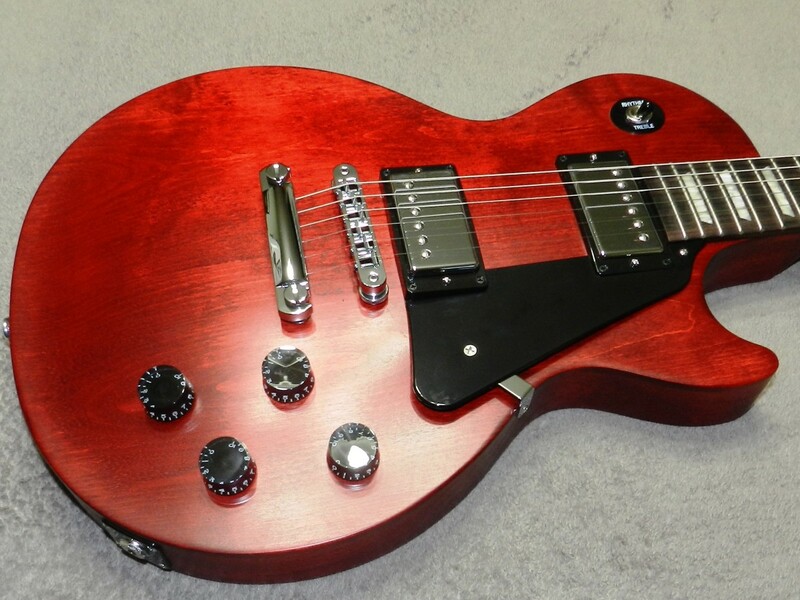 Nothing about the hardware looks or feels cheap, just typical Gibson. The vintage-style Grover Green Key tuners are solid and I’ve had no issues with keeping the thing in tune. I should also note that it was set up almost perfectly straight out of the box, though I may drop the action a bit. The Faded Studio is light (for a Les Paul), thanks to the modern weight relief body. I went with the Worn Cherry finish, and I’m very pleased with it. The Worn Brown doesn’t look so good, in my opinion. The Fireburst, on the other hand, is gorgeous, but I liked the Cherry just a bit better. As for the Satin Ebony, I’m on the fence. This guitar also has a few appointments that I happen to really like, just based on my personal taste. These include the black accents (as opposed to cream), the presence of a stock pickguard and the black speed knobs. These are in keeping with the traditional Studio design. In summary: No binding or fancy finish, but still a very sharp guitar featuring excellent craftsmanship and attention to detail. It checks all the boxes when it comes to tonewoods and hardware, which should be the foundation of any Les Paul-style guitar. The thin nitro finish on the Les Paul Studio Faded T lets the wood grain show through. The body and hardware make up the chassis of a guitar, but the pickups and electronics are what make it go vroom. Again, the Studio Faded keeps things basic. No coil taps or fancy wiring. Just the traditional two-humbucker design with two each volume and tone controls and a three-way switch. The humbuckers are Gibson Burstbucker Pros, and this was a point of concern for me going in. I knew I liked the Burstbuckers well enough, but I really like the 490R/498T set that comes on the Studio T. So, would the Burstbuckers get the sound I wanted, or would I have to pass? Remember, I was trying to decide between the more affordable Faded Studio and the pricier Studio T.
Turns out, I like the Burstbucker Pros quite a bit. I’d say they have a little more bite, and maybe sound a little more open while still retaining the low end I liked in the 490R/498T set. In fact, I may have even gotten to the point where I can say I like them better. Was expecting disappointment, but happily there is none to be found. The Burstbucker pickups sound great on the Faded Studio! I think one test of quality when it comes to guitar electronics has to do with the dynamics of the volume controls themselves. Your guitar should sound different at various volume settings, not just quieter. Each setting throughout the range of the volume knob should offer functional sounds with a specific tonal character. Guitars with cheap electronics tend to drop out quickly as the volume knob is turned down, and don’t really present a range of tones dependant on the volume setting. Since a guitar’s electronics are under the hood, this is an easy way to skimp on lower-priced instruments. So, would Gibson cut corners with electronics when presenting us with the super-affordable Les Paul Studio Faded T? Of course not! Even with heavy distortion the pickups clean up to a nice, rich overdrive as the volume knob is wrenched down, and retain plenty of character. With clean settings the sound is rich and full with the volume cranked, but dialing back still gives us some glassy, usable tones. In summary: I like the BurstBucker Pros a lot, and certainly more than I thought I would. They are rich and articulate with plenty of low-end, and all the crunch you could need for metal and hard rock. Gibson is on the ball with the electronics too, which should be no surprise. The Gibson Les Paul Studio Faded T is a simple guitar, but don't let that fool you! 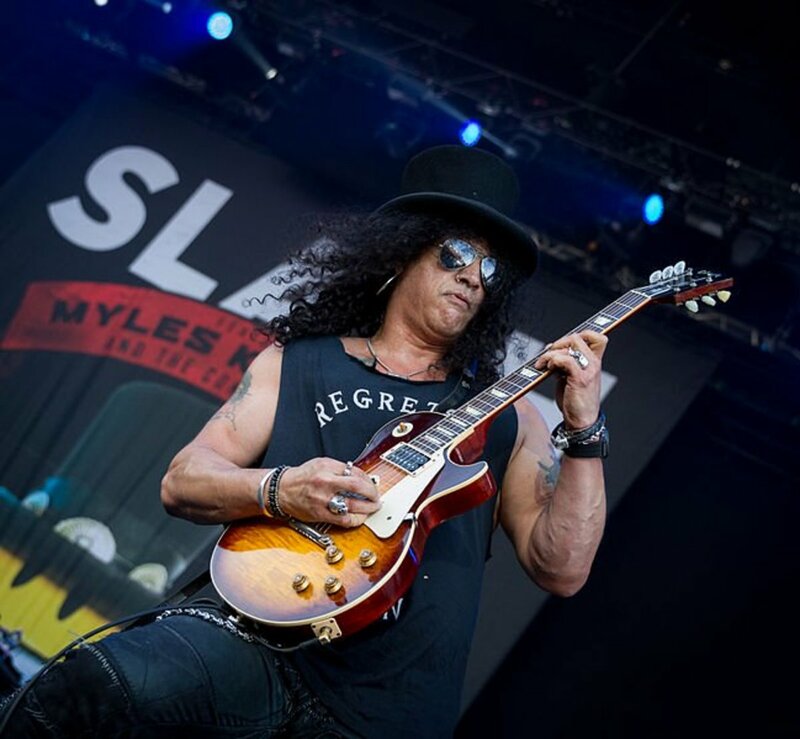 A guitar’s sound is such a subjective thing, and your opinion will depend on your individual taste, style of play and the genres you are into. I can only tell you what I think, and I’ve already done so a bit. It might sound strange, but I consider my Peavey Bandit 112 a good test of a guitar’s sound. It’s a high-gain, solid-state amp with a lot of low-end thump for a 1x12 combo. It’s not a bad little amp at all, but it can really accentuate any muddiness or lack of clarity inherent in a guitar’s design. This is especially true for guitars with bassy tonewoods like the Les Paul, but I’ve even had a few Strats that lost their luster because of poor performance with the Bandit. You can mask crummy pickups and tonewoods with a great amp to a certain extent, but these issues are hard to hide through a basic solid-state combo. In other words, if a guitar sounds good through this amp it will sound good through a quality tube amp, which is of course the natural habitat of the Gibson Les Paul. One of the things I watch out for is the thunk. It’s pretty simple: when you palm mute a low-E string with moderate to heavy gain and pluck it, it shouldn’t go thunk. You should hear a clearly defined note. If you get a bassy, boomy, inarticulate thunk instead, and you are sure your setup is okay, you’ve got a problem. Chances are if you fiddle around fretting other notes on your guitar you’ll notice a lack of clarity throughout. Not good. The Studio Faded T handles the Bandit without issue. It sounds fantastic at clean settings, with bell-like clarity and plenty of bass without getting boomy. With overdrive and high-gain it retains that clarity with some great harmonics and lots of character throughout the tonal spectrum. And, it passes the thunk test with flying colors. No muddiness, and lots of crunch. Does any of this make sense to you? It’s tough to explain sounds with words, but I’ve done my best here. Really, the best thing to do is hear the guitar for yourself! So, what don’t I like about this guitar? I don’t like the gig bag. I know this is one way Gibson kept costs down, but I wish it came with a case. The bag is very good quality, but it seems like the space where the headstock goes should be a little roomier. It’s a snug fit, and as a result you can actually see a bend in the bag at the headstock when the guitar is zipped in. I’m probably worried over nothing, but I don’t want to put any extra stress on the headstock when the guitar is in storage. I’ll likely invest in a decent hard case soon. 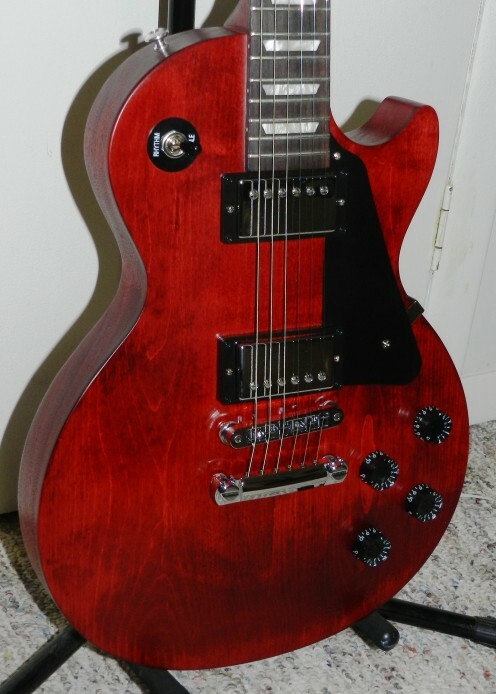 The rosewood fingerboard does not seem as high-quality as on Les Pauls I’ve had in the past. This isn’t so much a complaint as an observation, because the fretboard looks and plays just fine. I’m wondering if this is more due to the scarcity of rosewood in general rather than any effort to reduce costs for this guitar model in particular. Maybe a little of both. I’ll probably slap some Dunlop Straploks on it as well, eventually. I don’t like the idea of my guitars crashing to the floor, so this has been standard operating procedure for me for over a decade. Though, part of me wants to keep the guitar 100% original, and the stock strap buttons do seem pretty reliable. The Les Paul Studio Faded might be the best guitar under $1000 for 2016! In conclusion, I’m pretty darned happy with my Gibson Les Paul Studio Faded T, especially for the price. I think you’d be hard pressed to find a better guitar under $1000. 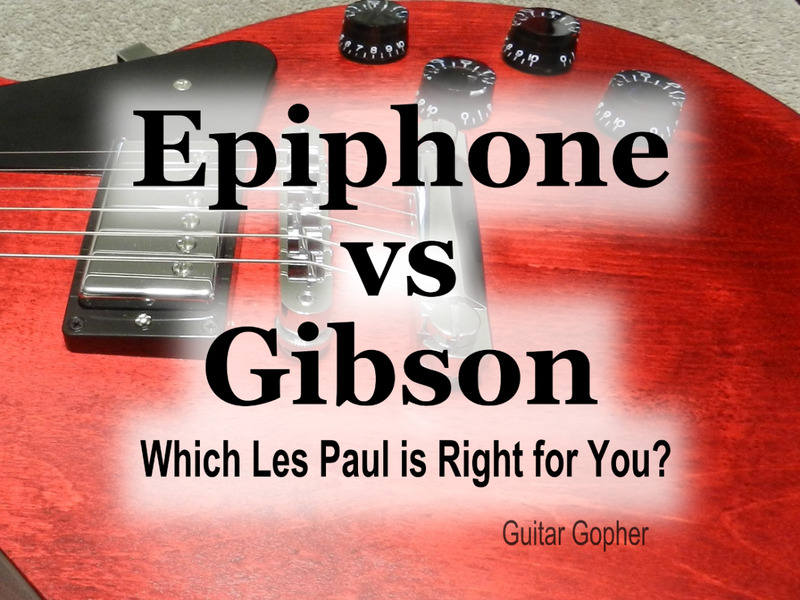 I’ll note that in addition to the Studio Faded and Studio T I considered an Epiphone Les Paul PlusTop PRO as well. I really like the ProBucker pickups, and Epis have improved a lot over the years. However, if you are looking for an affordable Les Paul and similarly on the fence, and you have a bit of extra cash, I really suggest going with the Studio Faded instead. I’m really glad I did. The true test of this guitar will be how well it holds up over time. I know mine only came out of the Gibson plant about a month before I got it, according to the paperwork that came with it. It’s got a long life ahead of it, I hope, and I expect it to be one of my main guitars for the foreseeable future. Unless, of course, a long-lost relative croaks and leaves me a big hunk of cash, in which case my main guitar will be a Gibson Les Paul Custom. But for those of us without hunks of cash who still love that Les Paul sound and vibe, there is the Studio Faded T. Well done, Gibson. I might need a Strat . . . I have a blue one fo these since 2014. Great guitar. My best player of the 3 I own. The neck is a bit chunky though. @Keith: Glad to see you went with the 2016 version, and for an awesome price too. I feel like the 2017 faded series took a step back from the Studio Faded from last year. I feel lucky to have grabbed one when I did. Enjoy your new guitar! Great detailed review ! I bought a very lightly used 2016 faded brown yesterday. Feel like I stole it, almost. Got it for $525.00 and included a nice hard shell case ! I am loving everything about this guitar. My 1st Gibson. Never thought I'd be able to afford one, but could not pass that up. Thanks for the comprehensive review. It was instrumental in my decision to buy one. I'm just learning the guitar and I agonised over whether it was excessive to buy such a serious instrument as a learner, but I thought that such a thing of beauty would inspire me to practice all the time. 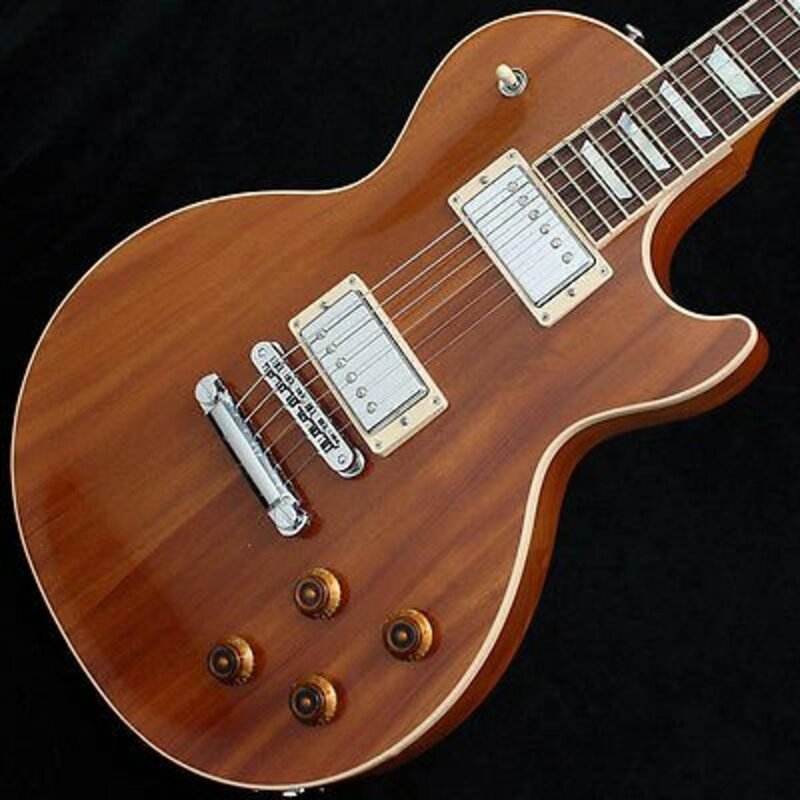 I also agonised over the choice between a good Epiphone and a lower end Gibson, but the consensus seems to be that there is something special about a Gibson that you can't get with the other. Then I had to agonise over the various options, which is where you really helped me out. Then I had to hunt far and wide to get the best price. Just found one at a great price and ordered it today. Mine is the Satin Fireburst, which was my 2nd favourite, but still beautiful. That was a very informative review, thanks for sharing! My GLP Faded studio is on it's way now! Hi Pedro. If by QC you mean quality control, from what I've seen I give it an A+. I understand your statements though. 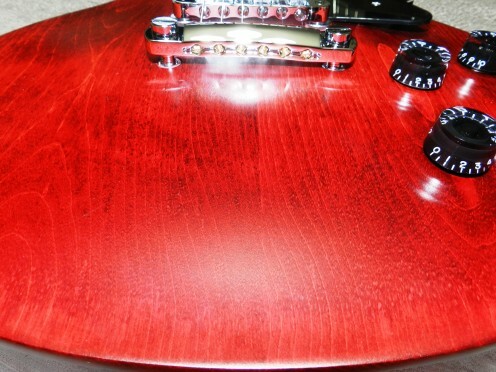 As I said in this review, I've handled faded-finish Gibsons in the past and they left me with kind of a "meh" feeling. They were fine for the money, but kind of rough around the edges, figuratively and literally. This guitar, on the other hand, is spot-on. The shop also had sunburst and worn brown models when I bought mine, and they both looked and felt fantastic, quality-wise. So, while my sample size is limited to three, I have to say I could not have expected more from Gibson at this price point. I didn't even have to make any adjustments to this thing when I brought it home, which is rare for me :-) So, I say go for it, and please report your findings back here if you don't mind. I'd love to hear what you think! Thanks for this amazing review. I was really for a review on this guitar :-). I've had this guitar in the past (2012) but I had to sell it :-( . I have a question, however. My LP faded had, from my point of view, a mediocre QC. I've had it changed twice, so I had 3 guitars ! One of them had the inlays with different colour tones. The ones closer to the headstock were kind of white and the ones closer to the bridge were cream !??! Then, on the mahogany back you could identify three pieces of wood glued together and not a single piece. On top of that, these guitars buzzed a lot (the 3 I had). Before buying this guitar again I would like to know from you, what do you feel about the QC on these guitars?